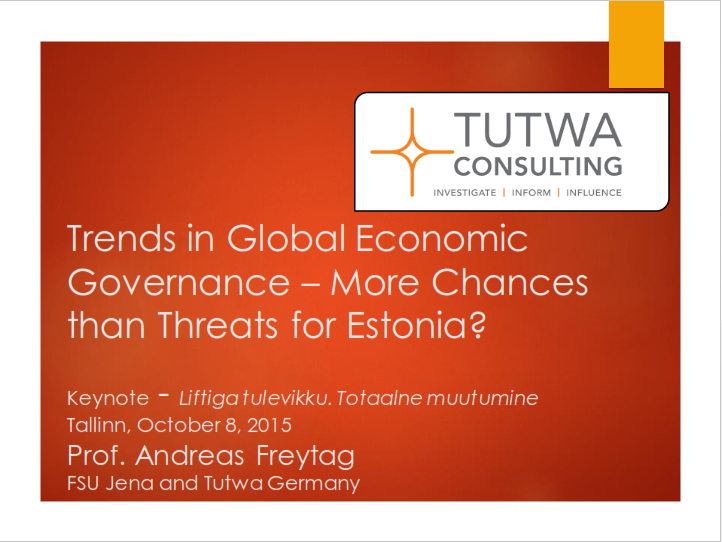 Tutwa Consulting Group – Trends in Global Economic Governance – More Opportunities than Threats for Estonia? Trends in Global Economic Governance – More Opportunities than Threats for Estonia? Tutwa Germany director Andreas Freytag gave the keynote speech at the annual conference of Enterprise Estonia, an agency established to enhance conditions for Estonian business. The theme of the conference was “Change” and Freytag dressed the challenges of new patterns in global governance for Estonian businesses. The event was attended by around 250 Estonian entrepreneurs who later that day celebrated their annual Entrepreneurship Awards. Emerging countries, like the BRICS group, have the advantage of relatively well developed infrastructure, education and communication to give impetus to development. However, these states’ relative lack of openness and economic freedom can cause problems later on. In this light Estonia’s challenge lies in tapping into GVCs which requires openness to trade and investment, good domestic infrastructure (financial, communication, physical, etc. ), and a sound education system, within an institutional environment that features world class rule of law, political rights and civil liberties, and economic freedom.